Three people died in a car crash and fire on Highway 101 in San Jose, Calif. on Feb. 1, 2015. 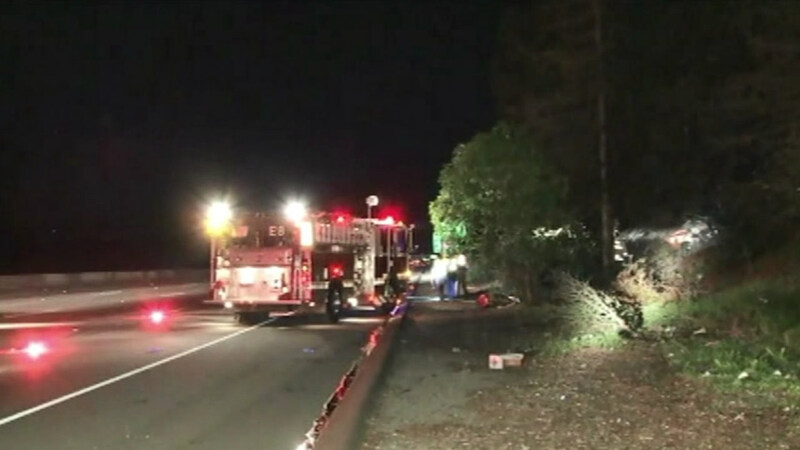 SAN JOSE, Calif. -- Three people were killed in a car fire on U.S. Highway 101 in San Jose after their vehicle went off the roadway and crashed into two trees early Sunday morning, according to the California Highway Patrol. Officers responded to a report of car fire on southbound U.S. Highway 101 just north of Interstate Highway 680 shortly before 2 a.m., CHP Officer Ron Simmons said. Arriving officers found a red four-door 2005 Infiniti sedan fully engulfed in flames, CHP officials said. San Jose firefighters were on the scene before CHP officers, extinguished the blaze and found three people inside had died, CHP Officer Ross Lee said. The Santa Clara County medical examiner's office was called to the scene. Based on a preliminary investigation, it appears the vehicle was traveling south on Highway 101 where it left the roadway, Lee said. The left front of the car struck a tree, traveled south, struck another tree and rotated clockwise, CHP officials said. The sedan then went into an embankment near Highway 101 at the split to Interstate Highway 280 and Interstate Highway 680 and caught on fire, Lee said. Investigators have not determined if alcohol was a factor in the crash, CHP officials said. A 34-year-old man and 31-year-old woman, both of San Jose, were inside the car, according to the CHP. Another man was also inside the car but CHP officials did not have information on his age or city of residence. The names of the decedents have not been released until they have been positively identified and their next of kin has been notified, CHP officials said. Anyone who witnessed the crash is asked to call CHP Officer Miguel Camarena at (408) 467-5400.